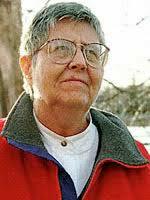 Mary Daly, radical lesbian feminist Catholic theologian who taught at Boston College for 33 years, died Monday at the age of 81. Daly was a pioneer in challenging patriarchal leadership and theology in all organized religion. Her theological writings and courses essentially started the feminist theology movement, which thrives still today at many seminaries. Her extreme feminism caused many to reject her, but no one can say she didn’t influence positive change. Those of us who are female ministers owe a lot to her courage and teachings. You can read more about her at NPR or on Wikipedia. Thank you to Amanda Symmes, who brought the news to me. This entry was posted in rev. frieda's blog. Bookmark the permalink.